Golden OPEN Acrylics are a true departure from all other acrylics on the market. expand the range of techniques that are available to artists who prefer to use acrylics. OPEN Acrylics remain wet far longer than other acrylics and resist skinning on the palette during long painting sessions. Working time varies according to how thickly the material is applied. Thin applications tack up allowing additional layers to be applied and blended. Thicker applications may be worked for hours. Films over 1/16 inch; will dry EXTREMELY slow. For impasto techniques, blend with faster-drying Golden Acrylics and Gel Mediums. Golden OPEN Acrylics feature a unique and remarkably relaxed set of working properties that facilitate blending, softening, shading, glazing and fine detail. The unique properties of OPEN Acrylics allow them to be used with natural fiber brushes and for a range of techniques including portraiture, plein air painting, monoprinting, and screenprinting. 2 mediums and 1 additive for ultimate control. 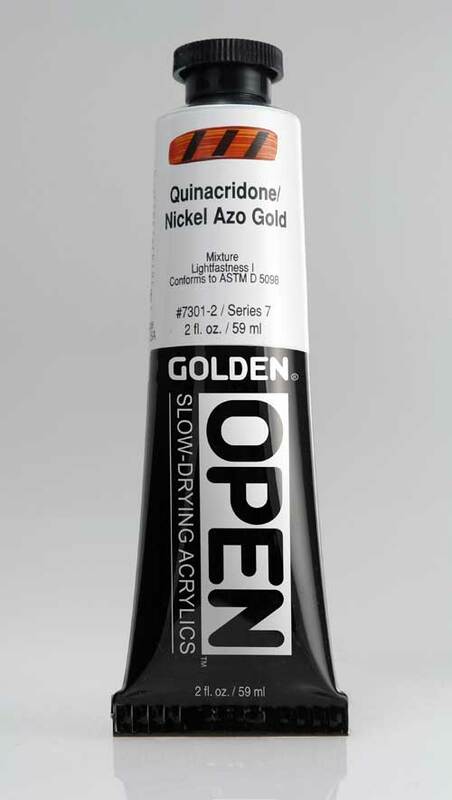 Use OPEN Mediums and Thinner to maintain the maximum working time of OPEN Acrylics. OPEN Acrylic Gel (Gloss) is recommended to adjust color strength and translucency while maintaining consistency. OPEN Acrylic Medium (Gloss) is formulated to a lower viscosity for a more fluid mixture with increased flow. OPEN Thinner contains no binder and is used to maintain and adjust the workability of colors on the palette without the use of water mist and moisturizing palettes. For an unparalleled range of working options, OPEN Acrylics may be blended with Golden Acrylics and Gel Mediums to change opacity or alter consistency, while proportionately speeding up drying and shortening working time. However, it is not recommended to apply fast-drying products over wet layers of OPEN Acrylics.